The Organic City or the Global Desert? 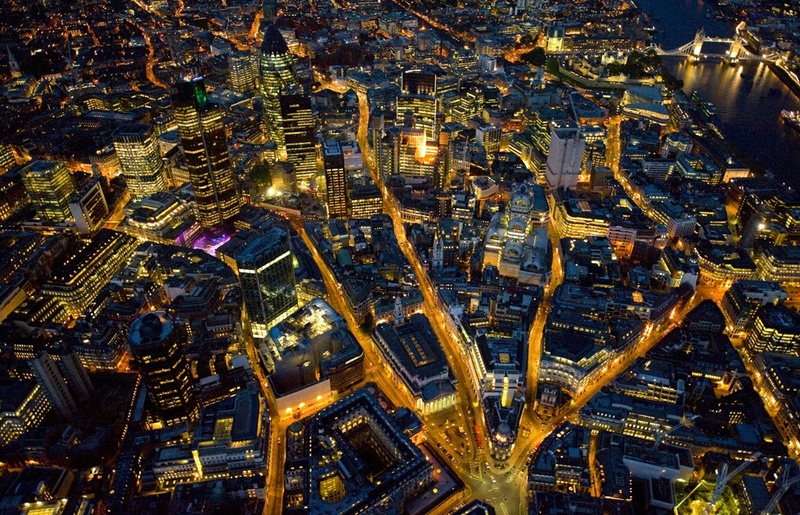 I love this photograph of London at night. The city is a living thing, pulsing with vital forces, growing relentlessly along natural paths. The lighted arterials flow like roots feeding a plant, like blood vessels coursing through the body, like water cutting through rocks to become the channels of a great river carving the landscape. That landscape is suffused with both energy and density–an incredible concentration of social organization and electricity. This achievement is marked by the bridge and the river in the upper right of the photograph. The coordination of human enterprise and natural constraint is there in miniature, an historical token whose small scale and simplicity underscores the enormous amplification of social, political, economic, and technological power characterizing modernity. So why talk about the desert? Because all that electrical power has to come from somewhere, and the enormous changes wrought by modernization in China, India, and elsewhere are–like the industrialized nations before them–rapidly depleting all natural resources, not least those that are non-renewable. Urbanization has been aligned with global warming and greater inequities in wealth, education, and many other social goods. To put it bluntly, one way to make a city (and a civilization) is to turn the surrounding area into a desert. 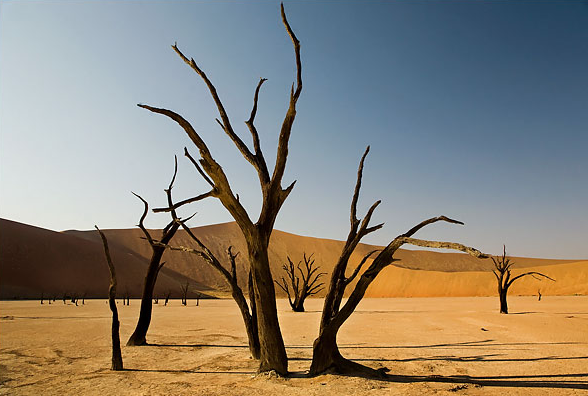 This beautiful image is from the Sossusvlei Dunes in Namibia. The caption in the New York Times describes the country as one of “stark beauty and riveting contradictions.” If you want riveting contradictions, you don’t have to go to Namibia, and the picture has more in common with London as well. Note how the desert trees have the same ancient natural form as seen in the aerial view of the world city. The reversal of the color fields emphasizes their similarity: the branching pattern is gold on dark in the city, and dark on gold in the desert. In place of the teeming life of the city, however, here we see an environment defined by scarcity. And in place of density, we find stability gained by resisting erosion. Deserts, like cities, are the result of both human and natural forces. London is the sum total of millions upon millions of decisions yet still subject to the deep interdependencies shaping the planet. Deserts will grow or shrink depending on how humans are or are not able to cooperate with each other regarding resource consumption, economic regulation, and other requirements for a sustainable modern civilization. Taken together, these two photographs remind us of one more thing: just as natural beauty is evident in both the city and the desert, nature couldn’t care less whether humanity brings itself to success or failure. Photographs by Jason Hawkes/The Big Picture and Evelyn Hockstein/New York Times. For more of Jason Hawkes‘ stunning photographs of London, go to this post at The Big Picture. The Times story on traveling in Namibia is here.